If you’re wondering why every week seems to bring some new disruption to your world, why once-solid institutions seem shaky, author Darrell West has some explanations. At the heart of them is the idea of megachange – itself rooted mostly in economics. Such periods of rapid disruption are cyclical, argues West, director of governance studies and the Center for Technology Innovation at the Brookings Institution. He explored these ideas in his new book, entitled Megachange: Economic Disruption, Political Upheaval, and Social Strife in the 21st Century. He joined the Knowledge@Wharton Show on Sirius XM channel 111 to talk about the tectonic shifts society is facing and how we might manage them. Knowledge@Wharton: Given the current landscape, with all it entails and all the connection ability we have, realistically should we be surprised that we’re talking about a term like megachange? Darrell West: We shouldn’t be surprised, because there is large-scale change taking place all around us. But it’s something people have not quite gotten used to. During a lot of our history, we existed in periods of small-scale and incremental change, so I argue in the book people need to adjust their expectations, because large-scale change is here and is likely to stay in the near future. Knowledge@Wharton: You write that megachange has had a historical line to it — that it varied based on what was going on in a country or in a portion of the world at a particular time. West: It seems like once every one or two generations, we just have an explosion of large things happening. When you look at American history, in the 1850s and 1860s we were dealing with slavery, had a civil war, and resolved that. Then, as we moved into the 20th century with the transition from an agrarian life to industrialization, there were lots of economics and political consequences of that. Then we had the Great Depression, and then lots of policy changes that took place there. And then the 1960s were a period of great change in terms of culture and lifestyle. So we see that these types of eras happen periodically, and today we’re kind of in the midst of another example of megachange. Knowledge@Wharton: Are there any common themes on why these megachanges happen when they do? You’re talking about a variety of different things in the book — war, commerce, invention, terrorism, politics. Is there a common link? West: The common link in a number of them is really fundamental economic transformation. Early in the 20th century, when we moved from an agrarian to an industrial world, it was just profoundly upsetting. People were moving from the rural areas to the cities, they were getting jobs in these large manufacturing plants, and so it changed the way people earned a living. Then there was a lot of wealth concentration, which had a lot of political consequences as well. Today, we are moving from that industrial era into the world of a digital economy, and we’re seeing a similar type of disruption. Jobs are changing, and people are getting anxious about the future and what life will be like for their children. We’ve seen a lot of that manifest in this presidential race, both in the form of the Trump campaign and the Bernie Sanders campaign — just people being nervous about all of these large-scale economic changes. Knowledge@Wharton: I think every year, we have some sort of strife on social issues. And obviously here in the United States, we’re seeing that play out in the intensifying debate about the frictions between the African American community and police forces. This is one of those periods of time that a lot of people are going to remember, and hopefully look back on from the future as a period of change. West: There are a lot of big social changes taking place. Certainly, all the tension surrounding race — it’s obviously not a new issue in American politics, but sometimes that issue is more quiet, sometimes it’s more turbulent, and now is a turbulent time. But we’re also seeing lifestyle changes — the rise of the marriage equality movement, legalization of marijuana. 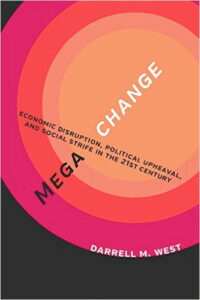 There are a lot of things going on, and what I argue in the book is that large-scale change makes people nervous. If anything, this is an age of anxiety. People are nervous about the economic situation, the social situation, and then all of that ends up having political consequences. Knowledge@Wharton: You write that in situations like this, a particular move is made, but obviously, a countermove has to be made because of that nervousness, and maybe a countermove to the countermove as well. West: Absolutely. Revolutions rarely are complete. What typically happens is some large-scale change takes place, but then people get upset about that, and there’s kind of a countermovement, a counterrevolution, and then out of that, you can get something completely different. We saw that in the case of the French Revolution, where there was a revolt against the monarch. They guillotined him, there was a short-term democracy, but then there was a lot of turbulence, chaos, and out of that came Napoleon. So sometimes, large-scale change can end up with very unpredictable ramifications out of this fight of the revolution and the counterrevolution. Knowledge@Wharton: Especially in light of what is going on now here in the United States politically, what kind of impact do you think the current rapid changes will have on our country over the next four years? West: This campaign has clearly produced a lot of anger and anxiety, just resulting from the economic changes, the rise of new digital technologies, the conflict among social groups. Even if Hillary Clinton ends up winning this campaign, Trump will probably get at least 40% of the vote. If you add the Trump voters and the Sanders voters together, they basically constitute a majority of the electorate. So whoever the next president is will have to deal with that. Even though Trump may not win, Trumpism is going to survive, and the anxiety about globalization, trade relations, the economic changes, the loss of manufacturing jobs. The next president is going to have to deal with all of that anxiety. Knowledge@Wharton: You talk in the book about how people and organizations really need to think about dealing with all of this megachange. What are some of the ideas that you bring forth? West: Organizations and businesses have to understand that this is a period of large-scale change and lots of disruption, so people need to adjust their expectations. A lot of our memories are actually pretty short term. People have civic memories of maybe 20 or 25 years, so I argue in the book we need to pay more attention to history — and organizations need to pay more attention to history — because if we’re looking for parallels to understand the current situation, it may not be anything that has happened in the last 25 or even 50 years, it may be something that happened 100 years ago, or 250 years ago. For some of the global developments in terms of the rise of ISIS, you really have to go back almost 500 years to find something like that organization. Knowledge@Wharton: One of the other megachanges we’ve seen involves the many issues the Catholic Church has had to deal with over the last 30 or 40 years or so. The Catholic Church that people knew just a matter of decades ago is certainly different than what it is today, and it’s probably is going to continue to change over the next few years. West: Absolutely. People often think about change just in terms of economics or politics, but when you look at just the last decade of the Catholic Church, it has gone through major changes. When you compare the last three popes that we’ve had, the first two are very different from the current pope, just in terms of the general philosophy, the type of approach that he is bringing to some of the difficult social issues facing the Church. So even a supposedly stable organization like the Catholic Church that has been around for 2,000 years is now going through lots of changes. And sometimes, a change that pushes in one direction is upsetting, and will generate a counter-sentiment that emerges in that organization. Knowledge@Wharton: One of the main themes in the book is that these megachanges will continue to happen. But in terms of the actual events that happen within them — let’s just consider terrorism — is the actual concept itself something you expect to become a constant? Will these megachanges themselves become constants in a society? 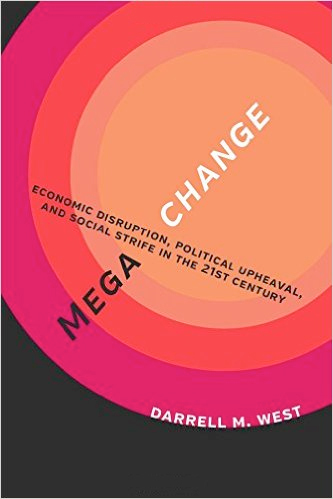 West: What happens is each megachange that emerges ends up disrupting the entire situation, and leads to other types of megachanges. In the case of terrorism, one of the problems the world faces is the rise of extremism in a number of different regions around the world. Then, when we see extremists in other countries acting in this really crazy way, and beheading people, it’s very upsetting to us, and sometimes we end up overreacting and responding almost in an extreme direction ourselves. One of the examples I talk about in the book is this: After the San Bernardino shootings, Trump came out with his famous comment that we should ban Muslims. Immediately, terrorist organizations included that part of his speech in their recruiting videos, and said this proves that America is engaged in a war on Islam. So we can almost end up in this very bad situation where extremism abroad can breed extremism at home, and you get this really bad interaction effect between those two things. Knowledge@Wharton: You also discuss how these megachanges have, to a degree, affected the political structure of our country, in the sense that if you go back 40 or 50 years, you probably had a lot more people who would consider themselves “moderate.” From some of the data you push forward, the idea of being moderate — whether you’re Republican or Democrat — is really going away right now. West: We have lost almost all of the moderates in the U.S. Congress, both on the Republican as well as on the Democratic side. And I argue that these governance developments are actually making our policy problems a lot worse, because when you have a lot of economic dislocations, and people are anxious as a result of that, we could actually deal with that if government took actions to help relieve that distress. If you go back to the early 20th century, that’s exactly what happened. People were upset about the move to industrialization, but there were policy actions, there were new social programs, there were worker-retraining programs, there was education assistance. It eased the transition, and we ended up coming out of that okay. Today, we have all of these problems and government seems paralyzed. We have polarization, there is a lot of gridlock, Congress can’t really pass much in the way of legislation, and so people end up being upset both by megachanges that are taking place and our political inability to the deal with the consequences of those megachanges. So unless we can do a better job in governing ourselves, we end up making our own situation a lot worse. Knowledge@Wharton: Is your expectation that the dysfunction we’ve seen here in Washington, D.C., will continue because, to a degree, megachange just leads to that sort of dysfunction? West: It very well could continue, but a lot of it depends on the election. If Clinton, for example ends up getting a Democratic Senate, but the House remains Republican, then the easy prediction is gridlock is likely to continue. The House Republicans will block things that she wants to do. People are going to end up four years from now being upset, saying we had a new president, she wasn’t able to do anything, and we’re still worried about all of these economic changes. But if, on the other hand, she ends up getting a Democratic Congress, both the House and the Senate, she might be able to take some actions that will alleviate some of the public discontent, and then four years from now people might say, “Oh, we had all of these problems four years ago, we’ve made progress, we’ve developed new programs.” People might feel better at that point. Knowledge@Wharton: You bring up a variety of different instances of things going on around the globe. Obviously, Iran is a big thing right now, and Brexit … what’s going on in Russia and its impact on Syria. And there have been a variety of issues with Brazil and Venezuela. So this is not exclusive to the United States. West: Absolutely not. In fact, what we’re seeing in this time period is that whatever happens in one part of the world affects a lot of other regions, in part because communications technology is global, and grievances that might once have been local problems now can go viral, and we can end up getting upset by something happening in Ethiopia or Somalia, or in Iraq. A lot of the governance problems that I point out certainly are not limited to the United States. The European Union is having huge problems right now — the United Kingdom, obviously, just voted to leave the European Union. China is having issues. Russia is becoming much more aggressive. So when you look all around the world, the thing that worries me the most going forward is just that the governance angle is very problematic in a lot of different places. We clearly have the ability to cope with the economic changes that are taking place, but if governance is flawed in virtually every country, then our ability to actually take constructive action is going to be very limited. Knowledge@Wharton: How many of the changes end up leading to change that is good, versus how many of them just lead to more frustration or more issues? West: There certainly are lots of positive megachanges that can take place. People have greater access to education, and generally that has been a positive development in many countries. But in the book, I am focusing on more of the problematic examples of megachange, because those are the ones we should worry about. Those are the ones that are creating the risk: the risk for democracy, the risk for capitalism, the risk of large-scale social destabilization of the sort that we’re seeing in Europe now with the refugee crisis. When you get people moving around, it just disrupts things. It makes people nervous, and bad things can come out of that. Knowledge@Wharton: Is there a way that we can try and bring countries together to realize the effects of these megachanges, and try to work to try and eliminate them to a degree? West: That is what the world did in 1945. We had the devastation of World War II, and afterwards, people basically came together, and they created new institutions. We had the Marshall Plan to rebuild Europe. There are a number of positive things that came out of what was a terrible period in world history. So clearly, what we need today is some equivalent of that — new institutions that can do a better job of governing here, new ways to extend aid to other places around the world that are struggling. But our capacity to take these actions still is pretty limited. That’s the reason I argue we need to go back and study history, because there have been many cases where the world has been at a crisis point, but we took effective action, resolved the situation, and things were able to move forward. Clearly, that is what we need to do today. Knowledge@Wharton: Going back to terrorism for a second. Some of the recent incidents have happened in France and Belgium. … I think a lot of people expected more change in a quicker manner. But terrorism in Europe has seemingly been a problem for several decades. West: Yes, many European governments have been surprisingly slow to deal with the threats within their own borders. You mention the various terrorist attacks that have taken place there: European governments spend a lot less on security than the United States does, so it is probably no accident that we keep seeing terrorist attacks there. They simply haven’t responded in a way to both deal with the problem, and then also to reassure their own people that they are going to be safe. So governments need to get tougher in that area. The United States certainly has gotten tougher as well, but that’s an issue that is going to continue to create problems around the world. Knowledge@Wharton: One of the other interesting subjects you discuss is the prison system here in the United States. West: When you look at the levels of incarceration over the last few decades, it’s striking just how many people the United States has put in prison. So I like to point out examples of where that has taken place, but that now is generating a countermovement of people recognizing that we have gone too far in that regard. There are a number of people fighting for sentencing reform, criminal justice reform, arguing that there are other ways to keep the country safe without putting millions of people in prison. That’s an example of where we’re starting to think about the changes that actually could improve that situation. Knowledge@Wharton: There are so many of these issues that are out there that need to be addressed. It’s not like there is just one overriding issue that needs this change. West: We’re living in a world of tidal waves, and as you mentioned, it’s not just one wave. If it were just one thing, it would be pretty simple to address that, but there are multiple tidal waves, they sometimes move in contradictory directions. It’s confusing, it’s chaotic, it’s hard to deal with. And that’s what makes the current period very difficult, because it’s not like there is one thing we can do and suddenly things are going to get better. There are lots of things that we need to do simultaneously, and that’s the reason we have to get our governing act together, because in a very complex period, it’s important to take effective action. Consider the counterintuitive possibility that the organizations which succeed will be those who creatively provide ways to *protect people from change,* rather than working to accelerate it. Obviously this can’t be done everywhere, but it can be done in certain places, environments, and niches — just as life finds ways to thrive even if it must work its way uphill against the laws of entropy.